The Arab Thought Foundation is set to launch a conference in Dubai focusing on employment creation next month. The 12th edition of the FIKR conference, under the theme ‘Job Creation: 80 Million Jobs by 2020 in the Arab World,’ will be held at the Ritz-Carlton, Dubai International Financial Centre on December 4 and 5. Meanwhile, the foundation was granted the ‘International Gusi Peace Prize for Social Services and Humanitarianism for 2013,’ for its contribution to cultural and intellectual development and the promotion of culture of dialogue at regional and international levels through its One Civilisation project and other projects in cooperation with international organisations. 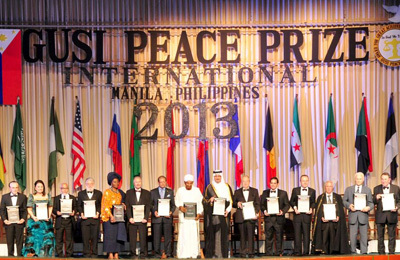 Prince Bandar Bin Khalid Al Faisal, chairman of the foundation received the prize on behalf of ATF during the 12th Annual Gusi Peace Price International Awards ceremony, held in Manila recently. The event included a series of activities, visits, receptions and programmes spread over more than three days, and it hosted a large number of delegates and laureates from all over the world. “This major award highlights and honors the efforts and achievements of a respected icon of international standing, which has made a mark as a cultural, non-profit and non-governmental pan-Arab organisation through its mission to achieve Arab cultural cohesiveness and promote Arab identity, safeguarding Arab culture and heritage, shaping and evolving our societies to improve current realities of the Arab people,” said Prince Bandar.